The mention of lard often conjures up an alarming image of clogged arteries leading up to cardiovascular catastrophes. Lard has also been unwitting involved in the recent food safety scandal in Taiwan where mass-produced lard was found to be adulterated with used oil, originally destined for industrial or animal use. 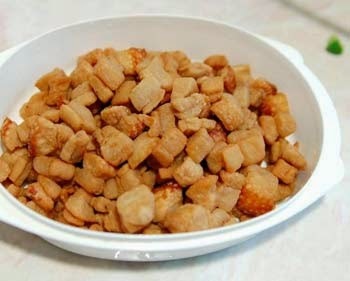 豬油渣 was one of the two favorite snacks for children, e.g., EyeDoc and his cousins, who grew up in Tamsui. Sprinkled with sea salt, it was absolutely delicious, a real treat, as a matter of fact. Quality fatty pork was on the expensive side and lard was relatively time-consuming to make. So when cheap peanut oil came into being, largely through the 配給 ration system starting in the 50s, housewives began to switch. Now, just like its cousin butter, lard has more or less been banished from our menus. 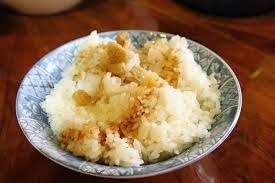 No one vouches for lard any more, even though we all know that traditional Chinese dishes prepared without lard simply taste wrong. Perhaps we need an advocate, someone like the famed TV chef and author, Julia Child (1912-2004) of Cambridge, Massachusetts. She had never shied away from liberal use of butter, the foundation of French cooking; a direct quote from Julia:. "In the 1960s, you could eat anything you wanted, and of course, people were smoking cigarettes and all kinds of things, and there was no talk about fat and anything like that, and butter and cream were rife. Those were lovely days for gastronomy, I must say." Although, as a result of the present lard scandal, home-made lard seems to be making a comeback. There is hope.